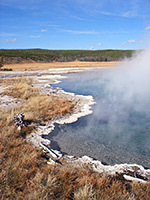 Most of Yellowstone's thermal features are found in the southwest quarter of the park, and although the highway passes close to the main sites, many more are reachable by long or short trails. The rivers of the southwest have numerous cascades and waterfalls, with the greatest concentration in the distant Bechler River basin (Cascade Corner) but others are much easier to reach. Bechler Falls 1.3 60 feet This short hike follows the southernmost section of the Bechler River Trail starting at Cave Falls, past the Bechler River-Falls River confluence to Bechler Falls, a small waterfall but still quite powerful. The trailhead is at the end of Cave Falls Road, in the remote southwest corner of the park. Biscuit Basin 0.4 (loop) level Biscuit Basin contains a group of small geysers and springs next to the highway, at the north edge of the Upper Geyser Basin. The loop trail passes all main features, and links with longer hikes to Mystic Falls, Fairy Creek and Summit Lake. Black Sand Basin 0.3 (loop) level On the west side of the highway near Old Faithful, Black Sand Basin contains five large geysers and pools plus other smaller features, viewable from a short, branched footpath. Divide Lookout 1.5 740 Beginning on the main road 7 miles east of Old Faithful, this short, unmarked trail climbs up a steep, wooded ravine to a summit on the continental divide, at 8,779 feet. Along the way are good views over the southwest of the national park, including Shoshone Lake and Mount Sheridan. Fairy Falls 2.4 level At Fairy Falls, Fairy Creek cascades 200 feet down the edge of Madison Plateau then flows northwards across marshy ground into the Lower Geyser Basin. The easiest way to reach the falls is from a trail that starts at the end of a very short side road leading to a footbridge over the Firehole River, a mile south of Midway Geyser Basin - this is the south end of an old vehicle track that links with the main road again at Fountain Flats after 4.5 miles, and provides alternative access to the falls from the north. This level track follows the side of the valley for a mile, past Grand Prismatic Spring to a junction with a narrower path that heads west to Fairy Falls, and links with the Fairy Creek Trail to reach several nearby geysers. Fern Cascades 3 (loop) 400 Iron Spring Creek flows from the forested hills southwest of Old Faithful then on through Black Sand Geyser Basin. Near the edge of the woods it tumbles down a steep incline over the Fern Cascades, not the grandest of Yellowstone's waterfalls but popular as it is just 1 mile from the highway. The trail continues through the woods and back to the road to form a 3 mile loop. Fountain Paint Pots 0.5 (loop) level Several dozen hot pools, mudpots, fumaroles and geysers are found along this short path near the Firehole Lake Drive in the Lower Geyser Basin. Lone Star Geyser 2.5 60 The most accessible backcountry geyser basin in Yellowstone - centered around Lone Star Geyser - is reached by an easy trail that follows an old service road through undamaged forest beside the Firehole River, starting at the parking area for the Kepler Cascades. Mallard Creek 4 920 This little used and now unmaintained route follows close to Mallard Creek for 4 miles, starting from the highway near the confluence with the Firehole River, to a junction with the Mallard Lake Trail. The creek flows down quite a steep, narrow ravine, and most of the path is across hillsides a little way above. The two paths to Mallard Lake can be combined with trails parallel to the road to form a loop hike of 11 miles. Mallard Lake 3 660 The relatively popular trail to Mallard Lake starts on the east side of the Old Faithful visitor complex by crossing the Firehole River on a footbridge then begins a steady ascent up a narrow ravine through pine forest partly burned in 1988. A stream running close to the trail flows past a number of hot pools and mudpots after about half a mile. Above the ravine is a rather steeper climb to flat-topped ridge, and a junction with the Mallard Creek Trail. The lake is a short distance further, down a slope. Midway Geyser Basin 0.5 (loop) 40 The smallest of the three geyser basins along the Firehole River is viewed from a short boardwalk trail that crosses the river then loops around Grand Prismatic Spring and Excelsior Geyser. Mystic Falls 1.2 150 Mystic Falls is a cascade on the Little Firehole River, where the waters drop 70 feet within a narrow ravine, shortly before joining the main river, and can be reached by an easy spur path that branches off the southern end of the Fairy Creek Trail. 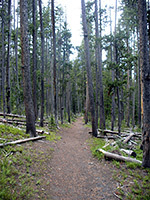 Starting at the edge of Biscuit Basin, the route is to follow the path heading west towards the forest, past one junction, fork left at the next junction (right is to Fairy Creek) and right at the third junction (left is to Summit Lake); this trail soon enters the ravine and passes the falls, 1.2 miles from the start. The path continues by climbing another 350 feet up the hillside and rejoining the Fairy Creek Trail. Turning right leads to an overlook of Biscuit Basin before descending back towards the starting point, a total loop of about 3 miles. Point 1.1 (loop) 160 The Observation Point loop trail branches off the main path through the Upper Geyser Basin, climbs a short, steep, wooded hillside to a viewpoint of Old Faithful and nearby features, then continues across the hill to Solitary Geyser, a bubbling pool in an open area of the forest. Sentinel Meadows 2.2 40 At the north edge of the Lower Geyser Basin, Sentinel Meadows offers a quick hike to a backcountry thermal region, containing geyser cones and a selection of hot pools of varying sizes. 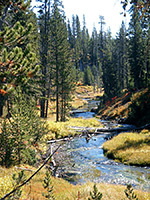 The trail begins at the end of the Fountain Flats road, crosses the Firehole River and follows Sentinel Creek westwards into the meadows. Spring Creek 3.5 360 The trail through pine woods along Spring Creek was once an old wagon track so now provides an easy walk beside the spring-fed stream, without passing any points of particular interest. It receives most use as a ski trail in winter. 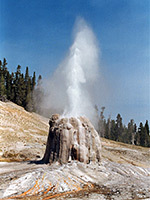 The west end is 1.5 miles along the Lone Star Geyser/Shoshone Lake trail, and the east end is near the main road 7 miles from Old Faithful - a short distance along the Divide Lookout Trail. Upper Geyser Basin 2.5 80 Not everyone walks the full length of the path through the Upper Geyser Basin, but the lower end is the most used trail in the park. From Old Faithful Inn, the flat, paved path follows alongside the Firehole River through the greatest concentration of geysers in the world. Short side trails lead to particular groups, and one longer diversion (Observation Point Trail) heads up into the hills. After Morning Glory Pool (1.5 miles), the path enters the forest for half a mile, but reaches more geysers (the Cascade Group) when it returns to the river. Bechler River 21 2,050 The far southwest corner of Yellowstone is a roadless land of mountains, meadows, rivers and especially waterfalls, with over 20 major falls and cascades along the Bechler River and its tributaries. There are only occasional thermal features but still this is the premier area for backpacking in the park, and the main cross-country route is the Bechler River Trail. This runs from the end of the road to the remote southwest entrance, alongside the river then across several miles of wide meadowland, up a long narrow canyon containing many of the best waterfalls, over the southeast corner of the Madison Plateau, and down into the valley of Shoshone Creek, where the river route joins the Shoshone Lake Trail, 6 miles from its northern trailhead at the Kepler Cascades. Beula Lake 2.5 200 The trail to Beula Lake starts outside the national park along FR 152, next to Grassy Lake Reservoir. The path climbs a hillside, crosses the South Boundary Trail, then is mostly level as it follows a low ridge to the lake - not an especially interesting hike but a good choice for peace and solitude. Boundary Creek 16 1,300 Boundary Creek is a tributary of the Bechler River on which are found 2 major waterfalls. From the Bechler River ranger station, a trail passes through flat forest and meadowland for 8 miles to the edge of a plateau, where the creek enters a ravine and flows over 150 foot Dunanda Falls. A nearby side canyon contains the 250 foot Silver Scarf Falls. Above the falls, the path continues further up Boundary Creek Canyon to the west boundary of the national park. Lewis Channel 6 120 This is a connecting path between the south entrance road and Shoshone Lake, and also loops around the north shore of Lewis Lake. The route starts on the road just north of Lewis Lake (next to the east end of the Shoshone Lake Trail), and first encounters marshy land around the lakeshore before turning away north alongside the Lewis River. De Lacy Creek 6.5 200 The popular De Lacy Creek Trail provides the shortest route to Shoshone Lake, reaching the northern shores after an easy 3 mile walk alongside the creek, through meadowland that is filled with wildflowers in summer and is often visited by moose. 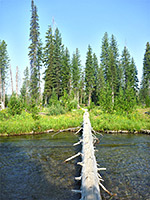 At lakeside a lesser-used path branches off to the west, leading to Shoshone Geyser Basin after 7 miles, while the main route continues along the steep-sided east edge of the lake to its outlet at the Lewis River. Fairy Creek 13 1,000 The northern section of the Fairy Creek Trail links the Lower and Midway geyser basins, and passes a number of thermal features including Fairy Springs, Imperial Geyser and Spray Geyser. The path begins at the end of the paved part of the Fountain Flats road, and follows the creek southward across marshy meadows and patches of forest heavily damaged in the 1988 fires, past junctions with the trails to Sentinel Meadows and Fairy Falls. The route is much less traveled beyond the two geysers, where it climbs quite steeply up to Madison Plateau, traverses flat land for a few miles then descends briefly into the canyon of the Little Firehole River, later climbing above the river, past Mystic Falls and down into Biscuit Basin. Mary Mountain 21 1,100 Only one trail crosses the Central Plateau in the middle of Yellowstone National Park, a varied region with scattered thermal features, mountains, lakes and much wildlife along the valleys. Most of the route of the Mary Mountain Trail is along the course of two creeks - Nez Perce in the west and Alum Creek (Hayden Valley) in the east, both of which are prime locations for bison, and grizzly bears. Separating the two valleys is the high ground of Mary Mountain, a flat, wooded summit where the path passes a few gas vents and hot springs. More pools are found at the western end of the route (the Quagmire and Morning Mist Springs groups). Because of the abundant wildlife, there are no backcountry campsites along the trail so it needs to be done as a day hike, hence a car shuttle is required at the end. Mountain Ash Creek 10 800 Mountain Ash Creek is a tributary of the Bechler River in the far southwest of Yellowstone, and provides a route for a trail from the high plateau in the east to the meadowland around the river. This starts beside the dam forming Grassy Lake Reservoir, just south of the park boundary, and runs beside the Falls River for a while before fording it and climbing into the hills on the north side, though a 2 mile side trail leads to several cascades further downstream. The main path crosses another drainage (Proposition Creek), then soon after descends towards Mountain Ash Creek which is followed most of the way to a junction with the Bechler River Trail. There are several other junctions en route including the trail to Union Falls. Pitchstone Plateau 16 1,600 Amongst the most remote and least-visited of the backcountry trails in Yellowstone National Park, the 16 mile hike over the open grasslands of the Pitchstone Plateau is a true wilderness experience. The eastern trailhead is along the south entrance road, 2 miles from Lewis Falls, from where the path climbs through pine forest for several miles, to the top of the lava plateau where the trees fade away. Near here is the one main hydrothermal feature along the way, the Phantom Fumarole. On the far side of the plateau, the path begins a long descent towards the southern edge of the park, meeting the Mountain Ash Creek Trail at its crossing of the Falls River. Rabbit Creek Group 3 (loop) 200 Off trail hike across grassy meadows and through patches of woodland, to a backcountry thermal area around the upper end of a short, east-side tributary of the Firehole River; about 40 major hot springs, of varying colors and activity levels. In two sections, separated by a forested slope. Summit Lake 16 1,270 The only path across the extensive Madison Plateau in the southwest of Yellowstone is the Summit Lake Trail, starting at Biscuit Basin, and reaching, as a half way point, circular Summit Lake at 8,553 feet, just on the Atlantic side on the continental divide. The route from the basin is a steady climb up a small ravine, through sparse forest without any thermal features, though near the lake is an area of hot springs and other pools. West of the divide, the path is almost level for many miles, through more open woodland and meadows but passing no more sites of interest, until it descends to the west boundary of the park, and meets a track in the Targhee National Forest. Union Falls 1.75 100 Regarded as one of the most spectacular waterfalls in Yellowstone, and the second highest (after the Lower Falls of the Yellowstone River), Union Falls is a 265 drop formed at the confluence of two upper forks of Mountain Ash Creek. 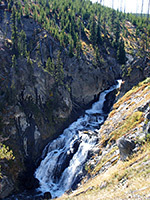 The falls are reached by a spur path along the Mountain Ash Creek trail, and are 10 miles from the starting point beside Grassy Lake Reservoir.